Horticultural oil eradicates insects by suffocating them. Horticultural oil also kills insect eggs by penetrating the shell and interfering with the metabolic and respiratory process. 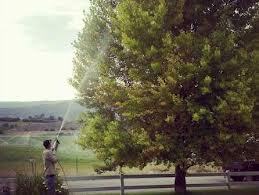 The oil disrupts the feeding process of insects such as white flies and aphids without necessarily extinguishing them. From an environmental point of view, Horticultural Oils have a minimal residual effect on beneficial insects. It is also a highly effective insect control for lawns. 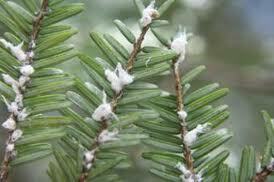 The hemlock woolly adelgid is an evasive insect that feeds on hemlocks. Feeding damage leads to decline and if not addressed, affected trees can and most likely will meet their demise. 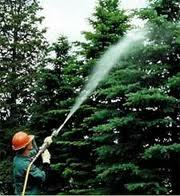 If you call us we can apply a few Horticultural Oil treatments throughout the season to safe guard and prolong the life of your hemlock trees.